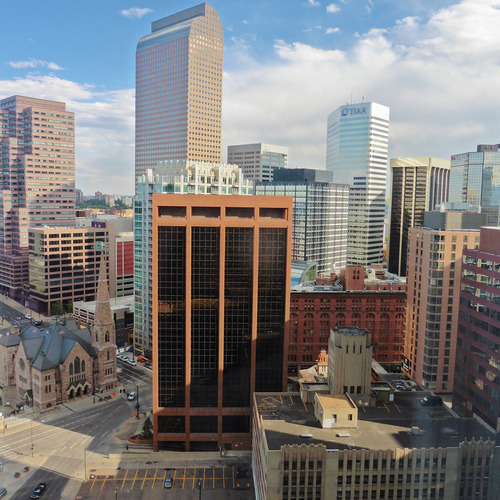 A grassroots effort to require green roofs in Denver has succeeded. Beginning in January, developers of buildings larger than 25,000 square feet will have to devote at least part of the roof to a vegetative covering or solar panels. This photo was posted on the Facebook page of the group promoting the idea, the Denver Green Roof Initiative. Neither the city’s mayor nor the Chamber of Commerce liked the idea, but Denver voters on Tuesday approved a measure that will require developers of buildings larger than 25,000 square feet to include rooftop gardens in their plans. 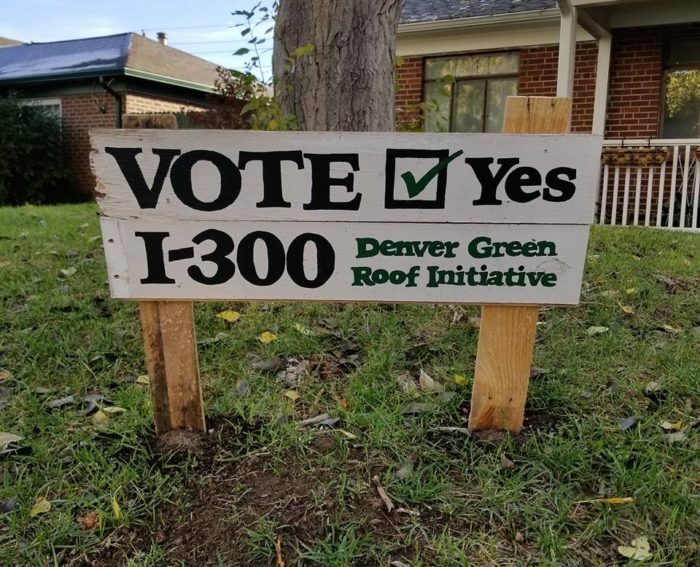 The Denver Green Roof Initiative, appearing on the ballot as Initiated Ordinance 300, passed by a narrow margin in early returns — a little more than 4,000 votes or 4 percentage points — but the gap appeared to be holding. Backers of the grassroots effort to get the measure before voters said it looked as though they would eke out a win. Mayor Michael Hancock said before the vote the initiative went “too far too fast,” and business groups such as the Denver Metro Chamber of Commerce also objected. Opponents racked up 12-to-1 campaign finance advantage, according to recent finance reports. 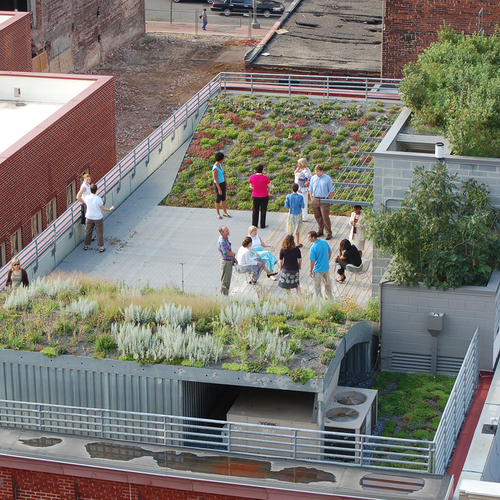 Q&A Spotlight: Do Green Roofs Temper Urban Heat? But business opposition wasn’t enough, and Hancock said a day after the vote that his focus would now be on implementing the ordinance, not seeking a way to block it. The measure goes into effect on January 1. A legal challenge from a commercial real estate development association, however, was still a possibility. 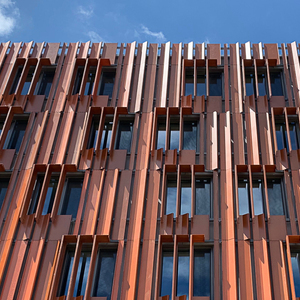 The ordinance is designed to lower the urban heat island effect — elevated temperatures due to the heat absorbing materials that make up much of a city’s built environment — and also help control rain runoff. 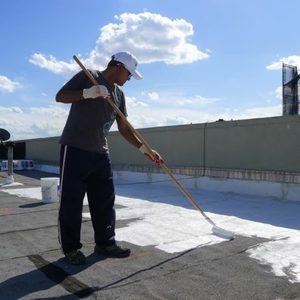 Backers said vegetative roofs are more durable in hail storms than conventional roof coverings, should last two or three times as long as a traditional roof, and result in lower operating costs for building owners. 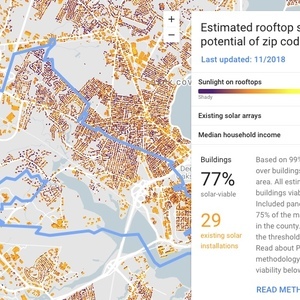 The measure affects new buildings of at least 25,000 square feet, requiring that 20% of the rooftop be covered with vegetation or solar panels. The percentage of the rooftop that must be covered rises incrementally as building size increases, reaching a high end of 60% for buildings bigger than 200,000 square feet. Existing buildings that are enlarged to cross the 25,000-square-foot threshold also are covered, as are buildings meeting size requirements when they are re-roofed. Building owners will be required to maintain the vegetation. It doesn’t apply to apartment buildings or houses of four stories or less. 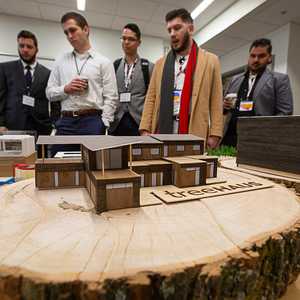 While backers emphasized the environmental benefits of vegetated roofs, opponents focused on costs. They said the plan will increase building and maintenance costs, result in higher rents, make it more difficult for Denver families to find housing, and waste tax dollars. “There are advantages to having green roofs, but we should not mandate it,” the Citizens for a Responsible Denver said. “The heat island effect is real, but the green roofs initiative is a clumsy and heavy-handed response to it,” the newspaper said. Denver’s new law appears to be modeled on an ordinance that took effect in Toronto in January 2010. It, too, establishes a formula for the amount of rooftop that must be covered by vegetation, beginning with buildings of at least 2,000 square meters (21,527 square feet) and ranging upward to 20,000 square meters (215,278 square feet). Coverage ranges from 20% to 60%, just as Denver’s new ordinance does. San Francisco says it was first city in the U.S. to require solar and vegetative roofs on most new construction when its “Better Roofs” ordinance took effect on January 1. It doesn’t go as far as the Denver or Toronto plans, requiring a maximum of 30% of roof space on most new construction projects to include solar, vegetation or a combination of both. 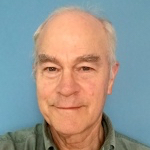 Mike Haynes, the sales and marketing facilitator at Michigan-based LiveRoof, which sells vegetative roof systems, said by telephone that as far as he knows Toronto, San Francisco and now Denver are the only North American cities with green roof mandates. Philadelphia, Chicago, the District of Columbia and New York City are among cities that offer incentives for green roofs, he said, but they don’t require them. One concern is what the vegetation will do to roof loads. 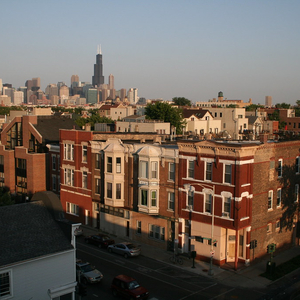 In new construction, higher loads can be engineered into the building, but older buildings of at least 25,000 square feet that are getting new roofs also would be required to meet the new rule. Haynes said the weight of vegetative roofs varies “drastically,” depending on thickness and density of soil and plants. A standard roof adds about 30 lb. per square foot, but walkable, park-like gardens can top 100 lb. per square foot, he said. Early on, interest among some city residents prompted city councilors to begin developing a green roof strategy, eventually leading to a university study on its benefits. The provincial government eventually decided to allow the city to move ahead with it as a sort of “trial run,” said Jane Welsh, project manager for environmental planning with the city. For most buildings, the increased costs of providing a vegetated roof are relatively modest when designed into the building (the ordinance applies only to new construction). One area of compromise was for industrial buildings — low, flat buildings with proportionally large roof areas that would have been expensive to upgrade structurally to handle even a lightweight green roof. The city cut back the required area of green coverage to 10% and allowed an alternate path of compliance with an option for reflective roof coverings and guarantees of stormwater management. In its final form, the ordinance allows a “cash in lieu” provision of $200 per square meter for builders who don’t want to include a green roof. But very few developers have asked for it — roughly 40 in the 1,400 applications for new development that have been submitted since the regulations went into effect seven years ago, said city planner Shayna Stott. The ordinance certainly has provided some aesthetic benefits for the city, but it’s too soon to tell whether it has done anything to mitigate the urban heat island effect, the planners said. 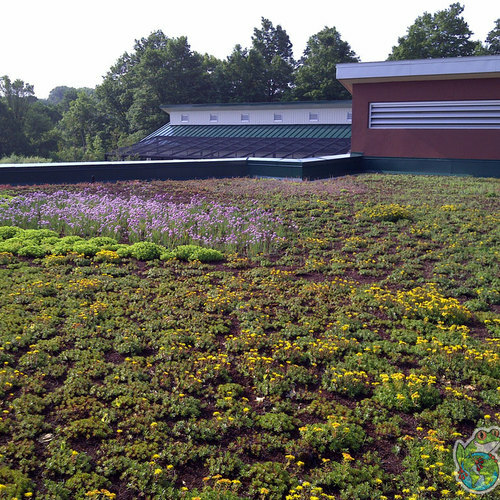 Although a couple of hundred green roofs have been built so far, the permitting and development process is a long one and there aren’t enough vegetated roofs in place yet to gauge the city-wide impact on summer temperatures. 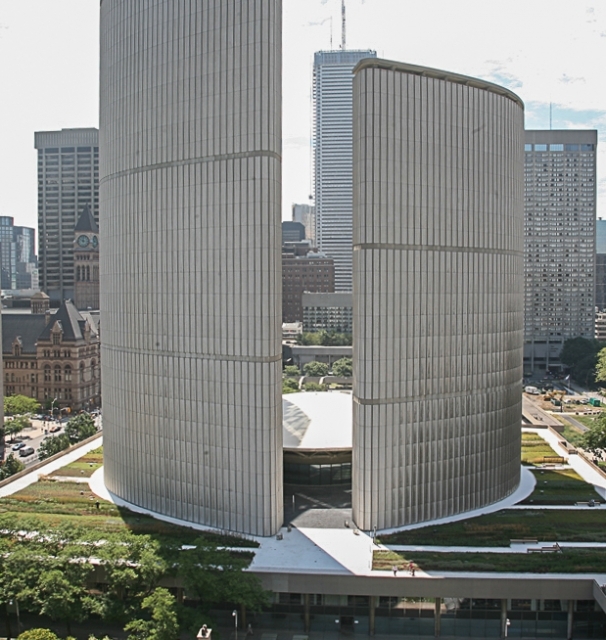 There may be more green roof initiatives on the horizon in Ontario, Walsh said, with the recent decision by the provincial government to allow other municipalities to develop their own versions. Ottawa, for example, may be interested in adopting one.